This sculpture is by Vivienne Roche. Vivienne is a sculptor who lives and works near the sea in Co. Cork, Ireland. Over an extended period she has worked in large-scale bronze, glass, steel, sailcloth, stuccodore plaster, and reconfigured landscape. Drawing, watercolour and photography have also been central to her work. Her artistic themes derive from site-specific dialogues between architecture and sculpture, the emotional resonances of the coastal landscape in which she lives, relationships between male and female, archaeology sites and their artefacts, and between music and the visual. Light has been a central focus as is evidenced in commissioned artworks such as NC Iris (2006), Whitelight Garden (2006), Light Ensemble (2008) and Light House (2009). In Dublin nothing is simple. 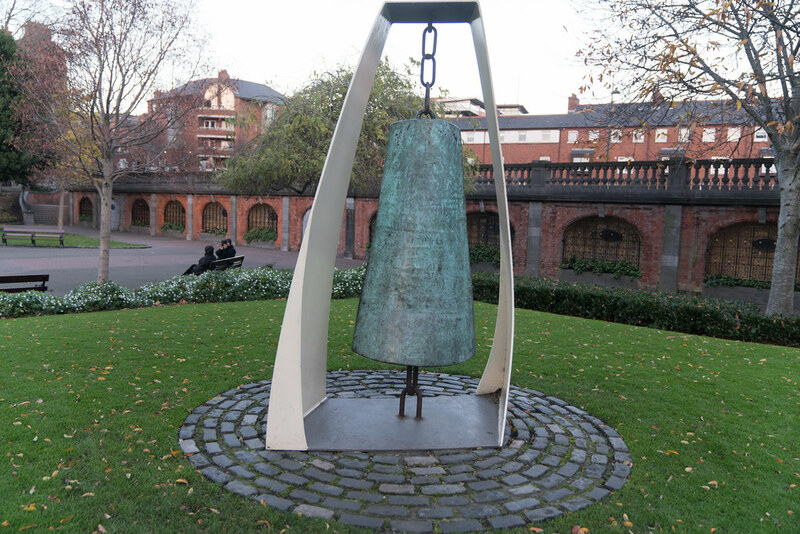 When it comes tho my friends if I say 'Liberty Bell' they think of the Liberty Belle' pub but a few think that I am referring to the 'Freedom Bell' but have no idea as to where it is located. However for me the first thing that comes to mind is an iconic symbol of American independence, located in Philadelphia, Pennsylvania. Wikipedia. 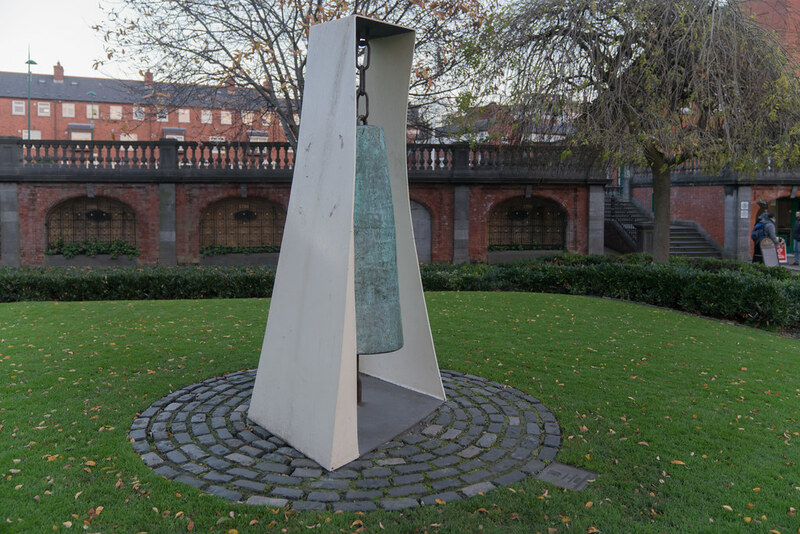 The sculpture in my photographs is named 'Liberty Bell' because it is located in the Dublin Liberties. 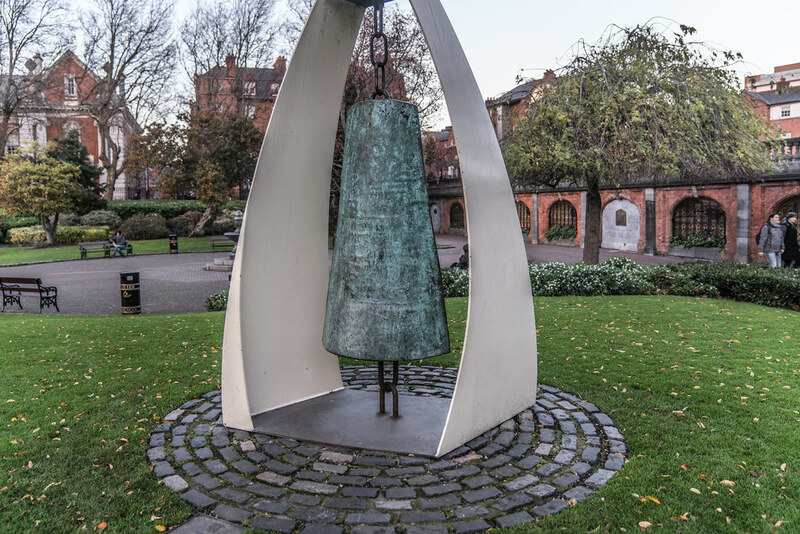 This bell is not to be confused with the 'freedom bell' above the smock alley theatre which used to be a Catholic church. It was purportedly rung by the Liberator Daniel O'Connell after the passing of Catholic Emancipation in 1829. The Liberties is an area in central Dublin, Ireland, located to the southwest of the inner city. 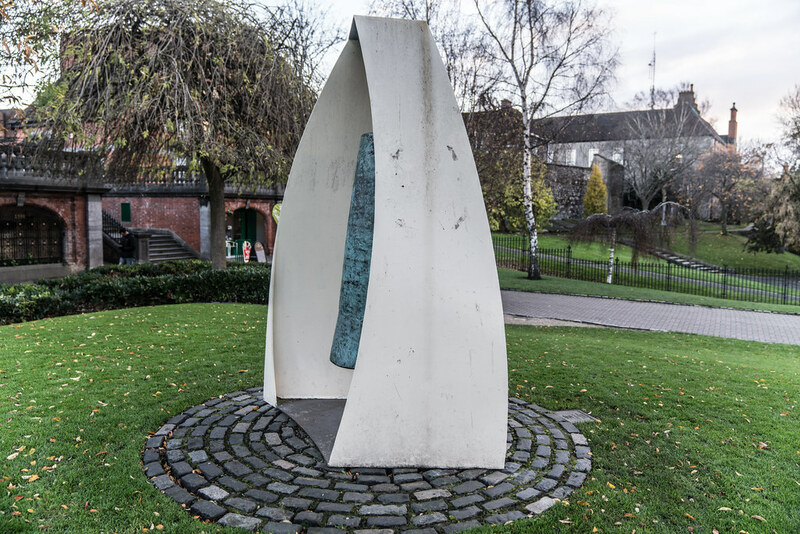 One of Dublin's most historic working-class neighbourhoods, the area is traditionally associated with social housing, market traders, local family-owned businesses, as well as whiskey distilling, it is now also a centre of enterprise and commercial life in the heart of the city. Today the historic city quarter sits side by side with dynamic media and tech hubs and highly respected medical and education centres. The name derives from manorial jurisdictions dating from the arrival of the Anglo-Normans in the 12th century. They were town lands united to the city, but still preserving their own jurisdiction (hence "liberties"). The most important of these liberties were the Liberty of St. Sepulchre, under the Archbishop of Dublin, and the Liberty of Thomas Court and Donore belonging to the Abbey of St. Thomas (later called the Earl of Meath's Liberty). The modern Liberties area lies within the former boundaries of these two jurisdictions, between the river Liffey to the north, St. Patrick's Cathedral to the east, Warrenmount to the south and St. James's Hospital to the west.